It’s been a tough few weeks, and although it seems that progress seems slow despite my best efforts to expedite it, I have to keep reminding myself that – no matter how many mistakes we make, or how slow our progress is, we’re still way ahead of everyone who isn’t trying. Where my startup concept is concerned, I’ve done up rough prototypes and am doing my best to push out beyond the ideation phase and to securing more help to make my idea a reality. They say that a man is the sum of his closest friends he keeps – and if I want to make my startup dreams come to fruition, I know I need to build a close, strong network of likeminded people who can support each other to succeed. Many books have talked about creating what they call a “Master Mind” – a group that harmoniously acts together to achieve higher purposes. What is a Master Mind? Master Mind groups have been formed for a wide variety of purposes – from goals as small as improvement in public speaking and fitness, to as large as building the largest corporations in the world. And you know what? I’m set on creating a powerful Master Mind that can help me achieve my business goals. What makes a successful Master Mind? A group of members with a diverse and complementary skill set definitely helps improve the effectiveness of the group as such a group can leverage on the varied experiences of the different members and together, solve problems in ways that one person cannot alone. A member to your group would only drag the others down if they are not committed and competent at what they do. Hill advises not to choose someone to join the group just because he’s your friend, do so because a person can truly contribute. Now Hill stresses this point as one that is extremely important as it would only do the Master Mind group harm to have someone who’s always pulling the others down, disrupting discussions and generally bringing in negativity in the group when we really should be aiming for a complete meeting of the minds, without any reservations. Should the team members all be in harmony with each other, brainstorming will be even more natural and ideas would flow much faster, making the solving of key problems happen much faster. This world is one that is full of abundance and I always believe that there is more than enough awesome in this world to be passed around to all! Make sure you reward your Master Mind group fairly, and they will take care of you! If the Master Mind group does not reward them financially, emotionally and growth-wise, it’s just a matter of time that competent members start leaving. Reward you group well. So how do I start my own Master Mind? After going through the material both from Think Rick And Grow Rich as well as other sources online, I realized that it’s really not difficult to set up your own Master Mind group that will serve a key support function in your ventures! Just find a few key members whom can contribute, can harmoniously with each other, and which can benefit from working with each other. Once you got that settled, do set up a clear schedule to meet up, probably once every two weeks to solve common problems and to keep each other accountable to agreed upon tasks that you have set during the previous meetings. I’ve already created a small Master Mind group that is already patiently nurturing the seed of my latest business venture, but am still looking for a few more key partners to this alliance, so do ask me about Master Mind groups should you meet me in person! Master Mind for Entrepreneurs in Singapore! I’m also on the look out for creating a Master Mind group in Singapore for budding entrepreneurs – so that we can all support and help each other reach greater heights – so also do let me know if you’re interested! I intend to start up a committed group real soon so let me know asap in the comments section below or via email at kevin@kevinc.net. I’ll probably want to meet up with you and see if you can jell with the rest of the group! Alright, enough about this wonderful new concept for now! Hope to hear from you fellow aspiring entrepreneurs out there! May we all help each other reach greater heights! I know that the Monday post is late, but I just got caught up in so many things and am still need quite a bit of time refining it because I really want to further collect my thoughts on the topic – creating Master Mind groups – as I really want to create a powerful Master Mind to help me achieve my personal goals. To make up for the lack of Monday’s post, here’s a short, inspirational personal history of a really respectable man that I hope all of us can learn something from. It’s especially dedicated to those of you out there who like me, have faced setbacks and as a result, felt demotivated and defeated in life before. 1831 – He failed in business. 1832 – He was defeated for the state legislature. 1833 – He failed again in business. 1836 – He suffered from a severe mental breakdown. 1838 – He was elected to Congress (but lost the 1848 re-election). 1855 – He was defeated for the Senate. 1856 – He was defeated for the Vice-Presidency. 1858 – He was defeated again for the Senate. 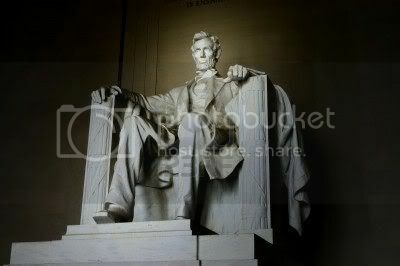 1860 – He was elected as the sixteenth President of the United States of America. Life can be hard, but how you interpret it is totally up to you. I’m choosing to look at temporary failure and defeat as a learning opportunity that will better myself… after all, failure is only temporary, given that you keep pressing on! More on a powerful strategy to help keep you achieve your goals – Master Mind groups – coming soon! There’s quite a real bit of uncertainty and doubt surrounding any new venture. Being at the cutting edge of any field also means that you’re constantly making guesses about the future. Now that I’m actually facing it all first-hand, I have a renewed respect for game-changing visionaries like Steve Jobs who managed to foresee the future of computing all the way back when he was just a fresh new tech entrepreneur with barely any experience. How are visionaries born? How do they see what others don’t? Whatever the answers to those questions are, I’ve learnt that one of the biggest obstacles to becoming a true game-changer is figuring out how to overcome your own personal doubts and make your vision of the future a reality. Right now I’m still trying to learn as much as I can, to work as hard as I can and to do my best to learn the experiences I go through. Below’s a short questionnaire for those of you out there who are in sales. Would really appreciate it if you guys could just answer those questions in the comments section below! It’ll really help me out! 1. Do you regularly send greeting cards to your clients? 2. When do you send greeting cards to your clients? 3. Why do you send greeting cards to your clients? What benefits are there for you? - it increases referral rates? - helps build rapport with clients? - leads to repeat sales? 4. What are the problems you face with sending greeting cards to your clients? Do you still think that physical greeting cards are relevant? 5. How do you stay in contact with your clients? Is it important for you to do so? Does it become a challenge when you have many customers? 6. How do you facilitate referrals from your clients? Is it a challenge or do customers willingly provide referrals? What are your current practices? 7. How do you follow up with your clients? What measures do you currently take to follow up with sales leads? What would make you follow up more? 8. What in your opinion would make your customer remember you? 9. What kind of help would you enjoy to help you perform your sales job at a higher level? 10. Is it hard to motivate your employees to go the extra mile to build rapport with your customers? What do you currently do to motivate your employees? Productivity’s been at an all time low as I’ve been running around packing, moving my things, and am actually back in KL for a bit as I’ve just moved out of my home in Singapore for the last 3 years – the halls of NTU. Sigh… got work to be done but the holiday mood back home is really getting to me. Where progress on my startup is concerned, it’s a double whammy – I’ve thought about some modifications to my startup concept and have ended up redrawing up my plans from scratch. I’ve flirted with quite a number of startup concepts and ideas over the past two years, but regrettably have not really put in the time and effort into really trying to make something work because I always seemed to find something wrong with the idea at the 11th hour. I don’t have the time for excuses any more, I have to get something done ASAP, or Singapore will literally force me to find a job (or deport me back to KL – permanently). That’s how bad it gets Kevin. Freaking get out of your holiday mood and start working on that idea already. Gah. Working on a proper timeline to get everything in check tomorrow morning and submitting it to my project manager to make sure I get things done on time. Time is precious, lots of it wasted, time to focus. I was initially planning on writing about how I worked on my business plan for it to reach it’s current state last week but a series of events just threw those plans I made out of the window – I met up with a group of really wise mentors and they persuaded me to look deeper into what makes the business really tick before I really move to the implementing stage. So it’s back to the drawing board for me, but I guess it would be better for me to be slightly late with a better formed, more exciting business plan, rather than one that wasn’t planned well. So I’m reworking the business plans right now armed with new insights and new directions. It’s pretty scary to have to put the plans you have worked on all aside and start anew, but I guess that’s how it feels like to be working a grand project that you can call your own – quite a lot of the time you’re poking around in the dark and just winging your way through. Anyway, what I’ve learnt this time is even though life can make it seem like all your effort can go to waste on whim – what’s important is the learning, the experience and the personal improvement life also provides. The more you grow, the better you get, the more likely you are to succeed. Gotta get over this slump and get working hard again!